Does it handle economic crises effectively? 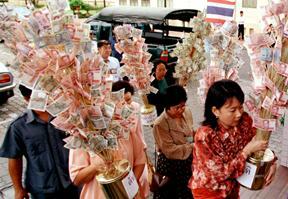 In 1997, an economic crisis started in Thailand and quickly spread to Asia and Russia. Now it threatens Brazil and the rest of Latin America. In trying to stabilize the global economy, the International Monetary Fund (IMF) prescribed some painful fiscal medicine. In exchange for the loans it provides to member countries to help them ward off financial crises, the agency requires governments to adopt austerity measures, including spending cuts to reduce government deficits and debt and higher interest rates to shore up weak currencies. Many critics say the fund's “cure” has been worse than the disease, causing essentially healthy Asian economies to become weaker. Some say the time has come for fundamental reform of the 53-year-old system of oversight provided by the IMF.